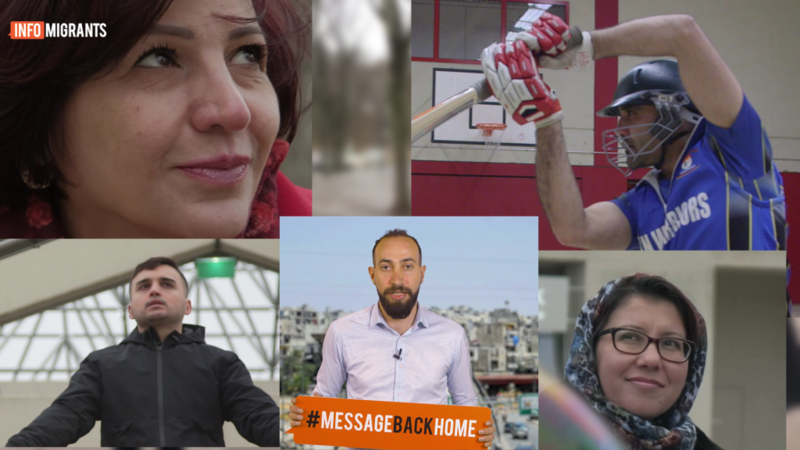 The first episode of #Messagebackhome will be launched on January 24, 2018 on infomigrants.net. "My goal is to be independent," says Halah Alhayik from Syria. The main motivation for the 52-year-old mother to leave her home country was her daughter. She was a student at the time, and Halah wanted her to continue her studies, which would not have been possible in the war-torn country. Life as a refugee was not easy for Halah in the beginning. "I miss everything about Syria, my culture… my identity," she explains with tears in her eyes. "My message back home is, we will come back to build up Syria with our souls and hands. We love you, Syria." A 22-year-old man from Tajikistan moved to Germany because he was facing threats and torture by the police due to his homosexuality. "Life is hell for the LGBT community in my home country." When he couldn’t deal with the persecution anymore, he left and fled to Europe. He misses his family, especially his mother. "All LGBT people want to live a normal and happy life, and contribute to society," he says, and wonders why their lives have to be so difficult. "I have very nice memories of my home country and I will always treasure them," says 28-year-old Amir Mangal, who came to Germany in 2016 from Paktia in Afghanistan. Mangal used to be a professional cricket player in the Afghan national league, touring different parts of the world. He left because he couldn’t live a safe and peaceful life any longer. In Germany, he wants to become a coach for young athletes to help them become better cricketers. His message back home is, "Love your country, love your soil." Aref Jabo, who is 28 years old, used to work in a medical laboratory in his home country, Syria. But after his family had experienced two wars (1973 and 2011) he decided to leave for Europe. Forced to leave Syria quickly, he did not know what to expect from his new home country. "It was very stressful in the beginning, especially learning German was difficult," explained Jabo. "I miss my family, friends, my job and the weather the most," he said. "My message back home is that I hope that once the war is over, everything will be rebuilt in Syria, the way it used to be before." Shahjahan Ahmadi is from Afghanistan and has been living in Germany since 2014. "I was an assistant professor at the University in Mazar-e-Sharif. I also worked for the ISIL forces," she said. Adjusting to life in Germany was not easy for her because everything was different: the society, the culture. "My message back home is that the Afghan government should be more serious about improving security," she said. "I hope that one day we have peace in our country and no Afghan will be forced to leave their homeland."